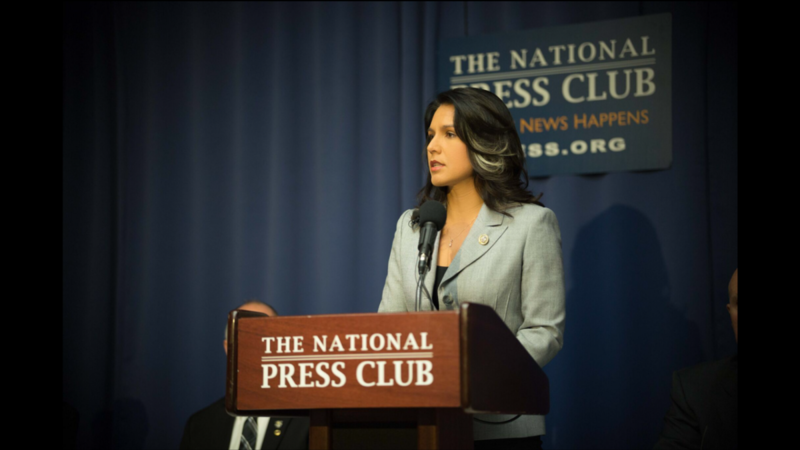 Among the many Democratic Party candidates running for President, only Tulsi Gabbard (image on the right) made an unequivocal statement condemning the coup, while leftist darling Alexandria Ocasio-Cortez limited her criticism to a retweet. Such conspiracy theories were immediately given credence when Trump announced, mid-coup, that he had a new ‘Special Envoy’ to Venezuela, thenotorious Elliot Abrams, made famous for his role in the Iran-Contra affair, where he was in the inner circle breaking laws while publicly advocating for the death squads (or “Contras”) that terrorized Nicaragua, Guatemala, and El Salvador, which is where the term “Salvador Option” was birthed. Abrams was convicted for his role in Iran-Contra but predictably pardoned by George H.W. Bush (who used his office as VP to Reagan to promote Iran-Contra).